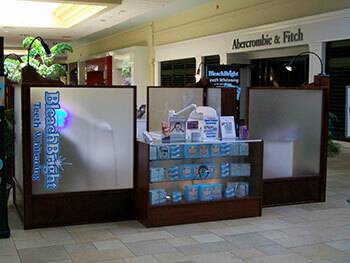 BleachBright pioneered selling teeth whitening services in malls. Our dealers in malls are some of the most successful dealers we have. We have dealers operating in both kiosks and in-line stores. Why open a teeth whitening mall location? 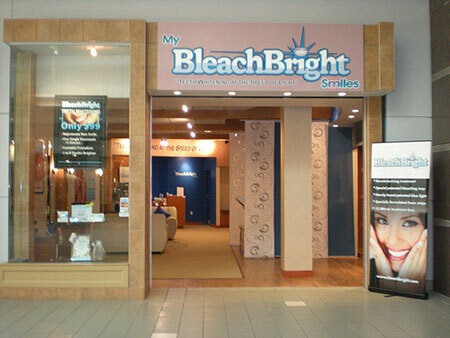 Why open a BleachBright mall location? We Started It - We're the pioneers and we've been through it all. We know what works. Products - We have an innovative line of high margin teeth whitening products that create excitement and referrals among your customers. Packaging - Our eye-catching product packaging speaks to your target market and inspires consumer confidence. Insurance - We provide, free of charge to our dealers, a $2,000,000 product liability insurance coverage that offers the maximum product protection for your business. Worldwide Branding - Our worldwide branding efforts work together with the marketing materials we provide to you to drive traffic to your business and generate sales.